It's going to be a huge year for Disney, as they have a ton of movies planned throughout the next ten months, with Black Panther already dominating the box office. One of the most unique releases coming soon is Christopher Robin, which revisits Winnie the Pooh and his pals from the Hundred Acre Wood. We're getting the teaser trailer tomorrow. But first, we have the poster which brings Winnie the Pooh to the real world for the first time ever. This is our first look at Christopher Robin, named after the young boy who befriends Pooh and his other spirited animal pals. Chris is all grown up, and has abandoned his childhood behind. But that doesn't stop the honey-obsessed bear and his friend piglet from trying to change his mind about the way things work as an adult. 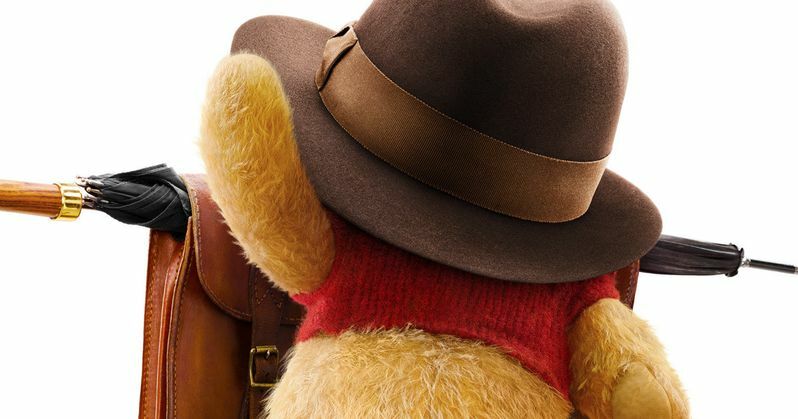 The poster shows us Pooh wearing Christopher's hat, leaning against his satchel and umbrella hinting that adulthood has crept into the Hundred Acre Wood, which just isn't good for anyone. The trailer will arrive just days after Disney also released its first official teaser trailer for Mary Poppins Returns. Tomorrow, Disney will unveil its first look at the live action adventure Christopher Robin. In the heartwarming family adventure, the young boy who embarked on countless adventures in the Hundred Acre Wood with his band of spirited and lovable stuffed animals, has grown up and lost his way. Now it is up to his childhood friends to venture into our world and help Christopher Robin remember the loving and playful boy who is still inside. Disney's Christopher Robin is directed by Marc Forster from a screenplay by Alex Ross Perry and Allison Schroeder and a story by Perry based on characters created by A.A. Milne. The producers are Brigham Taylor and Kristin Burr with Renée Wolfe and Jeremy Johns serving as executive producers. The film stars Ewan McGregor as Christopher Robin; Hayley Atwell as his wife Evelyn; Bronte Carmichael as his daughter Madeline; and Mark Gatiss as Keith Winslow, Robin's boss. The film also features the voices of: Jim Cummings as Winnie the Pooh; Chris O'Dowd as Tigger; Brad Garrett as Eeyore; Toby Jones as Owl; Nick Mohammed as Piglet; Peter Capaldi as Rabbit; and Sophie Okonedo as Kanga. You can check out the official poster here courtesy of Disney. There's no telling how much of the actually movie we'll get to see in the teaser, or if we'll even get a look at Pooh and pals, though from the poster, it appears that the iconic yellow bear will be getting a slightly different real-world make-over when he returns to screens in 2018.